TR Thomas’s new book “Aware” is a suspenseful and gripping page-turner that involves a horrifying plot and unparalleled fear and dread. Recent release "Aware" from Page Publishing author TR Thomas is an engrossing narrative that delves into the heart of human survival amidst monstrous atrocities brought about by a horrid catastrophe. TR Thomas, a passionate literary genius, an English major with an emphasis in literature, a psychology and sociology minor, as well as having worked at Disneyland, has completed his new book “Aware”: an engaging tale of dread and horror as Owen and his companions face the beasts that lurk around and prey on those who failed to adapt to the horrifying change in the food chain. Published by New York City-based Page Publishing, TR Thomas’s engrossing novel shows the primal side of humanity in times of nigh-doomsday, and reveals the contrasting perspective of animals thought to be completely bestial and violent. The book also unveils that a fight for safety and survival can only be handed over to those who adapt, evolve, and are fit. 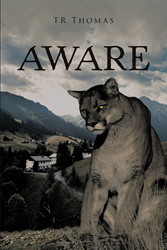 Readers who wish to experience this riveting work of fiction can purchase“Aware” at bookstores everywhere, or online at the Apple iTunes store, Amazon, Google Play, Kobo, or Barnes and Noble.